Hail to Spring and the return of the birds! Maslenitsa, or Butterweek, has just ended, and Zhavoronki, or the return of the larks, was celebrated earlier this month. Leigh Bardugo's fantastical young adult Grisha trilogy weaves both of these Eastern Orthodox celebrations and much more into her fictional culture of Ravka, a magical echo of early 1800s Tsarist Russia. 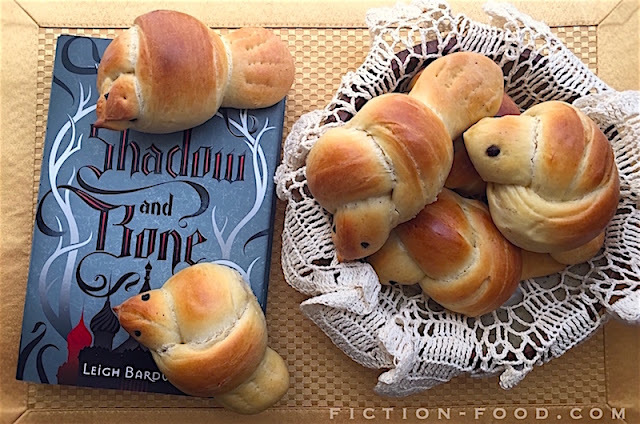 In book one, Shadow and Bone, spurred on by a desire for more diverse fare even though she is running for her life, the main character snags a bird-shaped roll during Butterweek celebrations inspired by those still made in Russia today to celebrate the coming of Spring. "Mal stopped to buy furs and stock up on supplies, but when I saw him shove a wedge of hard cheese into his pack, I stuck out my tongue. If I never saw another piece of hard cheese again, it would be too soon. Before Mal could tell me not to, I darted into the crowd, snaking between people trailing behind the dom cart where a red-cheeked man sat with a bottle of kvas in one chubby hand as he swayed from side to side, singing and tossing bread to the peasants crowding around the cart. I reached out and snatched a warm golden roll. 'For you, pretty girl!' the man shouted, practically toppling over. The sweet roll smelled divine, and I thanked him, prancing my way back to Mal and feeling quite pleased with myself. He hesitated. 'I didn’t say that.'" After a scuffle with a couple of ne'er-do-wells, she shares the now misshapen bread with her companion/best friend/love. The bread and the sharing of it is simplistic and poignant in its symbolism. "'I still have the roll,' I offered lamely, pulling the squashed, lint-covered lump from my pocket. It had been baked into the shape of a bird to celebrate the spring flocks, but now it looked more like a rolled-up sock. Mal dropped his head, covering it with his hands, his elbows resting on his knees. His shoulders began to shake, and for a horrible moment, I thought he might be crying, but then I realized he was laughing silently. His whole body rocked, his breath coming in hitches, tears starting to leak from his eyes. 'That better be one hell of a roll,' he gasped." 1. In a small pot on low heat, combine the milk, sugars, & butter. Cook until the butter is melted, stirring occasionally to help it along. Pour into a bowl, let the temperature lower for a few minutes, & then stir in the yeast. Leave it undisturbed for about 10 minutes to foam up. 2. Whisk together the flour, salt, nutmeg, & cinnamon in a large mixing bowl. Make a well in the center & add 2 of the eggs plus the oil & the yeast mixture. Mix on low with the dough hook attachment until a dough forms & pulls away from the sides of the bowl. Turn the dough out onto a lightly floured surface & knead until smooth & elastic. Spread a little bit of oil around the mixing bowl (using a paper towel helps) & lightly coat the dough with oil too. Lay the dough back in the bowl & cover with plastic wrap & let rest & rise for 1 1/2 - 2 hours, until double in size. 3. Punch down the dough & knead it a little more. Roll it into a thick log about 12" long & then cut it into 1" sections. Roll each section into about a 9" long rope & loop a simple knot close to one end. Pinch a point onto the tip of the short end & press & flare out the long end (the short end is the bird head & the long end is the tail). Lay the bird dough knots at least an inch apart (preferably more) on a parchment paper-lined baking tray. Press the backside of a knife into the tail ends of the birds, not going through the dough all the way, to create feather lines. Use a toothpick or skewer to press eye holes in the head end of the dough, & then press in little pieces of dried currants. Cover the rolls with plastic wrap & let sit for about 20-30 minutes. * Learn more about Maslenitsa here, here, & here. * Learn a little more about Zhavoronki here & here. * For more food from Ravka, here are a couple of recipes on Leigh's website created by the fabulous Elle Jauffret, plus you can download a free pdf of Elle's S&B inspired recipes! 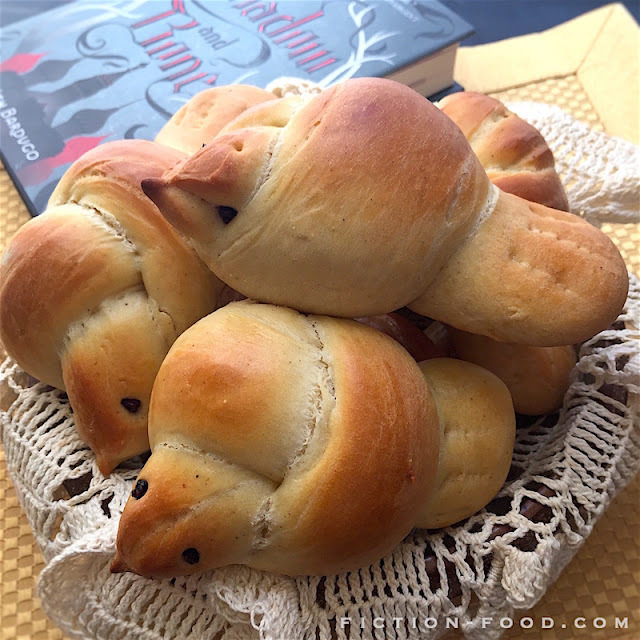 * For more about the food in the Grisha trilogy, click here for an interview with Leigh on The Midnight Garden. 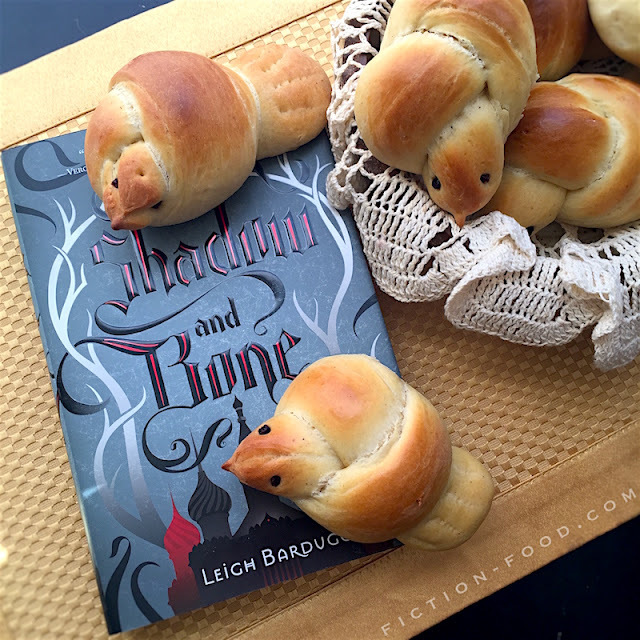 * And lastly, for Shadow and Bone book club ideas, including a menu, click here for a post on Delicious Reads!